Does your mother fail to show any genuine love for you…or empathy? The trademark of a narcissistic mother is her inability to give love or empathy to her child. One of the hallmark symptoms of a narcissist is her inability to perceive others as people with needs of their own. A narcissistic mother is only able to see her children as extensions of herself-little mirrors that reflect back to her. She values her children only so much as the children can benefit her; she is exceptionally self absorbed, sometimes to the point of grandiosity. A mother with narcissism may demand that her children excel in school and sports for the simple reason that it will make her look like an admirable mother to people outside of the immediate family. It is of no importance to her whether or not the children develop, or even learn, from these achievements as long as her reputation remains intact. Characteristic signs of a narcissistic mother would also include excessive preoccupation with herself and with her self-image. She is unable to give her children even the most basic emotional support that they need to grow up to be well-adjusted adults. Narcissists can go into a “narcissistic rage” over the littlest thing which results in belittling, emotionally abusing and, not infrequently, physically abusing her children. The typical narcissistic mother is almost impossible to please no matter what the circumstances. She often snubs or scorns her children’s attempts for affection. A narcissistic mother does not have children for the same reasons a healthy person would. She does not look forward to their births to see what they look like or watch their personalities develop. She has them strictly for the sake of having more mirrors to look at herself in she wants little miniatures of herself. She resents all the work that goes into child rearing and sees it as a burden. She “hands off” child rearing, inappropriately, to the child itself as soon as she can. A narcissistic mother may come off as a loving, caring parent because she will have an exclusive and possessively close relationship with her children in order to control and manipulate them. Although most parents watch with pride as their child begins to learn independence, a narcissistic mother feels every step away from her is an absolute act of betrayal. 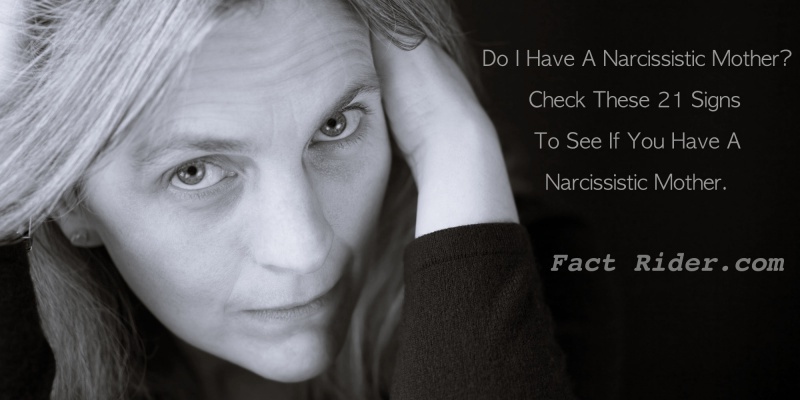 Other characteristic signs of a narcissistic mother are habitual lying and constant criticism of the child under the guise of being a caring parent. She lets them know in no uncertain terms, verbally and nonverbally, that they are not as good as other people. Her narcissistic tendencies do not end in childhood but continue on through adulthood where she continues to interfere and damage their self esteem and any relationships they might form. Children of narcissistic parents frequently experience difficulty forming healthy relationships and are at increased risk for depression and anxiety.